2015 is off to a slow start for investors, as stocks closed the second quarter essentially flat year-to-date and bond returns were generally negative. There are some positive takeaways from the second quarter that should not be overlooked, however. The economy is again growing slowly (likely near 2% in the second quarter) after grinding to a halt in the first quarter. The thought of the first quarter stall leading to a recession is fading, and while our WCA Fundamental Conditions Barometer is far from strong, it has stopped slipping and has even seen a small bounce in recent weeks. The bottom line is that overall conditions seem to indicate that the economy continues to grow, a positive for equities. Crosscurrents between generally stronger domestic data and weakness in China, along with recurring worries over Greece, produced a grudging improvement in our WCA Fundamental Conditions Barometer through the second quarter. We expect real domestic GDP growth to accelerate from the first quarter’s modest contraction, but remain below the long-term trend. Overall, the mix of data in Q2 was moderately positive. 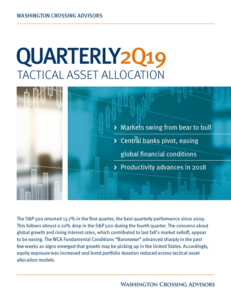 NEAR-TERM TACTICAL POSTURE: The CONQUEST portfolios are allocated in accordance with our WCA Fundamental Conditions Index and long-run return considerations. The index slipped from September through the first quarter and appears to have stabilized in the second quarter, suggesting the U.S. economy is picking up some momentum. 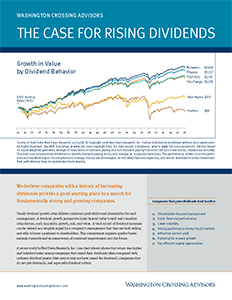 We remain moderately underweight equities as we move into the second half of the year. Meanwhile, China’s slipping growth rate and Greece’s troubles are weighing on investor expectations. Consequently, we remain overweight domestic equities within the equity allocation. No tactical changes were made during the second quarter.